Today: How to make family dinner feel a little more like adult dinner. There is a long list of foods no child would ever eat that this column has told you to feed your children. Let’s not relive all the failures right now. Let’s just acknowledge it is possible that your children now live at a separate address with an intercom system. Or that they have installed parental controls that prevent your computer from accessing this site. Or that they now distrust everything you put before them and eat nothing but cereal without milk, because who knows what you have done to the milk. But if all members of the family are still on speaking terms, then it is time for shellfish. Because I am exceptionally dense, I have always thought that shellfish should be on the kids' menu. Right after grilled cheese and spaghetti and meatballs, the menu should read: a dozen mussels. If the kids eat the whole dozen, they get the shells to take home for the sandbox. Reason #1: Kids will think eating meat out of the shell is sort of weird. It is sort of weird! This is not how people eat other fish and animals. When we make pork for dinner, we rarely spilt open the carcass and then eat the meat inside it with a fork. (Only on special occasions.) But this weirdness is as likely as not to be appealing to children. Always remember, parents: children are monsters. Reason #2: Kids will think shellfish taste icky. Well, yes: for oysters. Oysters are sort of icky. That said, it is important your child be exposed to oysters before leaving childhood, because if he is not, it is possible that the first time he tastes an oyster it will be on Valentine’s Day and that oyster will be in his mouth and then suddenly it will not be in his mouth anymore but it will not be in his stomach either. The heart wants what it wants, but sometimes it fails to inform the body. It is unlikely something this inept and humiliating would happen to someone else too, but still. Think of introducing your child to oysters as a down payment on your future grandchildren. But you have to work up to oysters. This is why there are the starter shellfish, mussels and clams, which come with almost zero ickiness. 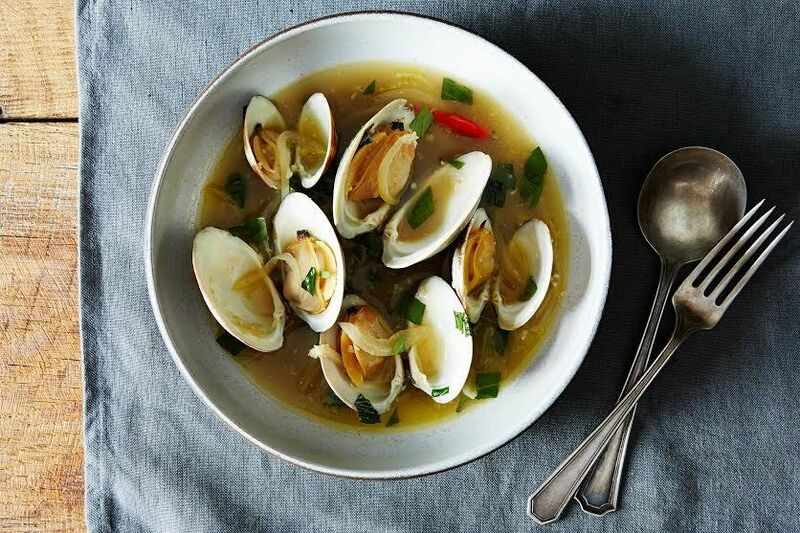 If anything, clams suffer from the opposite problem -- not too icky, but too tough. 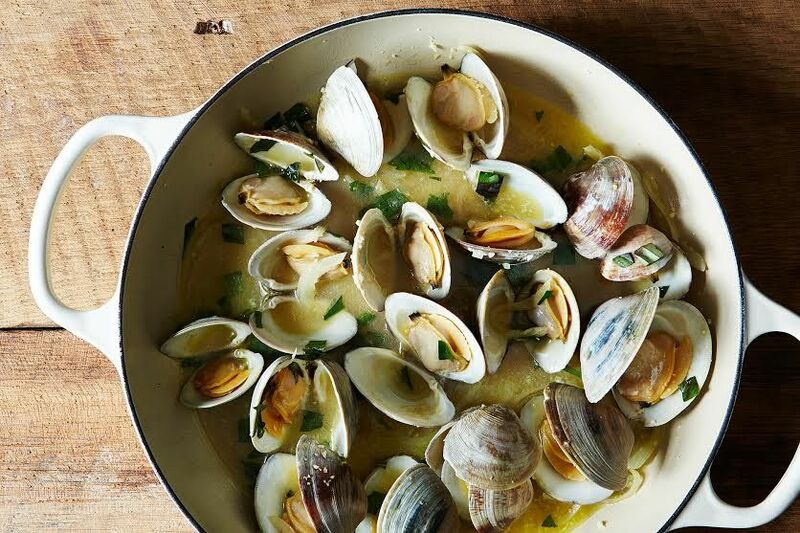 Admittedly, it feels less like adult dinner when each member of the family speaks through a shellfish for the entire dinner -- but a lot of adult dinners could really use more of that sort of thing. Plus, if the dinner goes downhill, the shellfish-puppet trick can be very useful at couples therapy. Try not to relive the oyster incident. There are clams on the kitchen counter right now for my dinner. I'm the child (albeit one in her twenties). The parent came in just now and wrinkled his nose up at them hoping they're not his dinner too..! This is a very entertaining take on kids and food and shells! Not to mention their parents. I have to say my daughter, at 4, also adored clams and decided they make great spoons when eating paella with shellfish. She also took to octopus and barnacles long before she could embrace garlic, which is quite a strong gustatory stimulus for young tastebuds. Love this recipes, thanks! My 2.5 year old LOVES clams and will shank you if you try to take one from her that she has scored. Especially if they are in their shells - such a fun little serving vessel, she thinks. I think it is all about how/when you present things - if it is a matter of "you won't like this" or "you only have to try a bite and then you can go back to your PB&J" then of course they won't want it. But if you start from "look, isn't this neat, and yummy?" they will get excited. My 7 yr old niece adores mussels and will fight you for them. She's been eating them for two or three years now. I have never served my daughter clams in the shell but she has eaten clams since she was young. I love all this kid clam/mussel LOVE. Both of my kids LOVE mussels and clams and really enjoy the astonishment from servers at restaurants when they order them. This is sure to be a big hit at my house. Nicholas, Can you please upload a video of the "shellfish-puppet trick"? Not enough space on the internet, just tried. This is lovely stuff. And it is almost identical to the recipe I made the other evening from "The Slanted Door" cookbook! Oh, yes, that's what it is -- attributed above and in the recipe, too.